Over the last little while there has been a growing concern about the decline of bee populations both locally and internationally, so in the absence of questions for Chris to answer, he muses on the “humble bumble”, and work being carried out to better inform us on how to protect their future. After a trip last April to Gisborne to attend a Trees for Bees conference I have been taking a great deal more notice of bees and their activities. Before the introduction of the honey bee into New Zealand 150 years ago, all the flowering native plants were mainly pollinated by native solitary bees and birds. 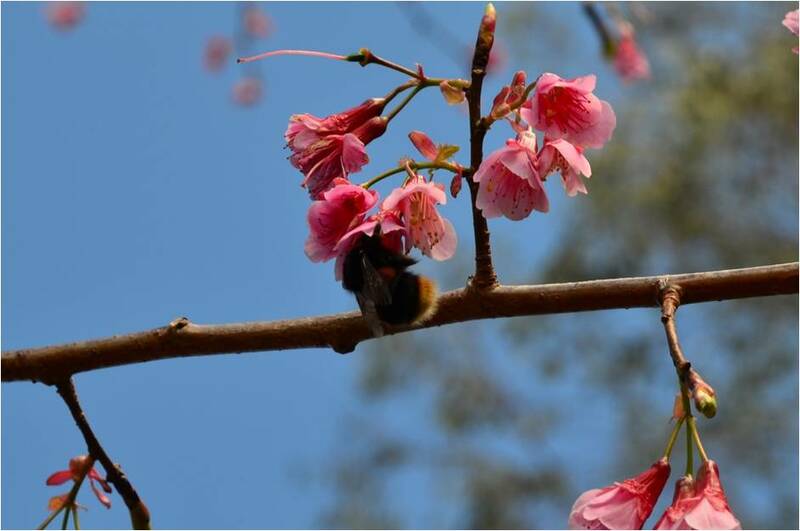 At the same time and ever since, a very wide range of exotic trees and plants have been introduced, many of these providing high quality nectar and pollen for the honey and bumblebees. The busy bee goes about its work largely unnoticed but is responsible for pollinating over 80 percent of the world’s food producing crops as well as being our only source of honey. The bumblebee was brought from England in 1885 because it was realised that white clover, also an import, was not being pollinated and therefore not producing the seed to replenish this nitrogen fixing plant. It is estimated that this nitrogen fertilisation is worth about $4 billion to farmers. There is only one common bumblebee in this area, although it may seem that there are a number of different species because they can vary in shades of colour and size. The female workers vary in size so that a wider range of plant flowers can be used. The bumbles have a longer tongue than the honey bee and can utilise large flowers such as those on a paulownia and foxgloves. The bumblebee is becoming more valuable with the decrease in honey bees. It is likely that the wild or feral honey bees are now extinct due to Varroa mite. The bumble’s ability to work longer days at much lower temperatures than its relative is increasingly important. It can do this because in flight it has a thorax temperature of 35 degrees C. maintained by its high revving wings. For this to be maintained the bee needs a constant source of food and so tends to seek out a wide range of flowers all the time. The honey bee tends to focus on one or a few plant types. The main cause of bee deaths in New Zealand is probably the pest mite Varroa. This appeared in Auckland in 2000 and had spread to Bluff by 2012. There are many other causes of deaths and weakness including viral and bacterial diseases, loss of habitat, pesticides, and changes in land use and farming such as large areas in monoculture. In Canterbury John Hartnell, a Bee Industry specialist has noted many cases of bee losses due to irrigators. Because of this concern about the future of the honey bee, the local Hawke’s Bay Branch of the Tree Crops Association has been making observations since last September on the trees and other plants that attract bees. A great deal has been learnt and this work will continue after winter. The existing published lists of Trees for Bees have a limited range and we know that we have many more potential species at the Guthrie-Smith arboretum. This year we now have the expertise of Dr Linda Newstrom Lloyd to help with her specialised knowledge on collecting nectar, pollen and plant samples with the view to publishing some really useful information for everyone concerned about helping the bees survive.